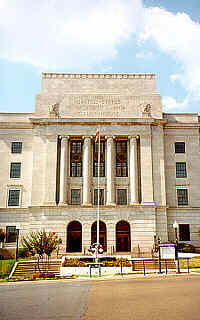 The post office and federal courthouse in Texarkana is the only federal office building in the U.S. to straddle a state line. This is a picture of that symmetrical building, and the Arkansas/Texas boundary runs right down the middle. I straddled the state line myself (standing on the yellow line in the middle of State Line Avenue) while taking this picture. That's Texas on the left and Arkansas on the right. Note the differing texture and color of the pavement on the left and right sides of the road. Texarkana maintained separate post offices until 1892. This is the third joint post office occupy this space, which is sometimes called "Photographer's Island," apparently because so many people do the same lame, touristy thing I did. The base is made of pink granite from Texas. The walls are made of Arkansas limestone.